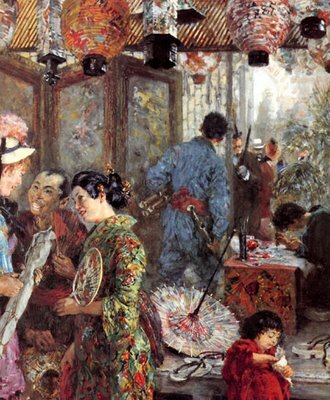 'the japanese painter,' by adolf von menzel, was unusual for him; it's impres- sionistic though he stated he disliked impres- sionism and wished to paint painting more real than photographs. he has managed to capture, perhaps, the spirit of east meeting west better than a photograph ever could. interesting that he called this what he did as the painter appears to be all but an afterthought. what is von menzel, whose main claim to fame are his portraits of frederick the great, saying with this? on exhibition until october 3, 2006 at the new national gallery in berlin. show title: berlin-tokyo/tokyo-berlin.